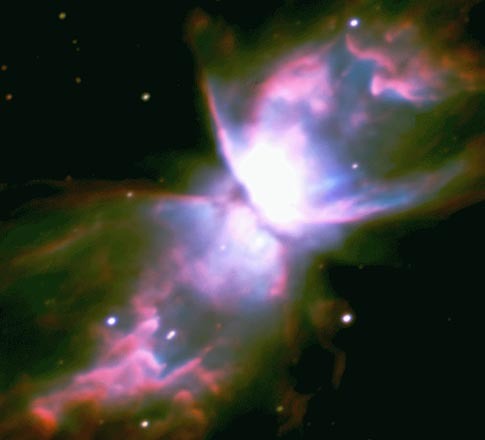 Explanation: The Butterfly Nebula is only thousands of years old. As a central star of a binary system aged, it threw off its outer envelopes of gas in a strong stellar wind. The remaining stellar core is so hot it ionizes the previously ejected gas, causing it to glow. The different colors of this planetary nebula are determined by small differences in its composition. This bipolar nebula will continue to shine brightly for only a few thousand more years, after which its central star will fade and become a white dwarf star. The above picture is one of the first ever taken by the Very Large Telescope (VLT), a new 8.2-meter telescope located in Chile.